Calculate the internal resistance of a voltage source if the terminal voltage of the source increases by 1 V when the current supplied decreases by 4 A? 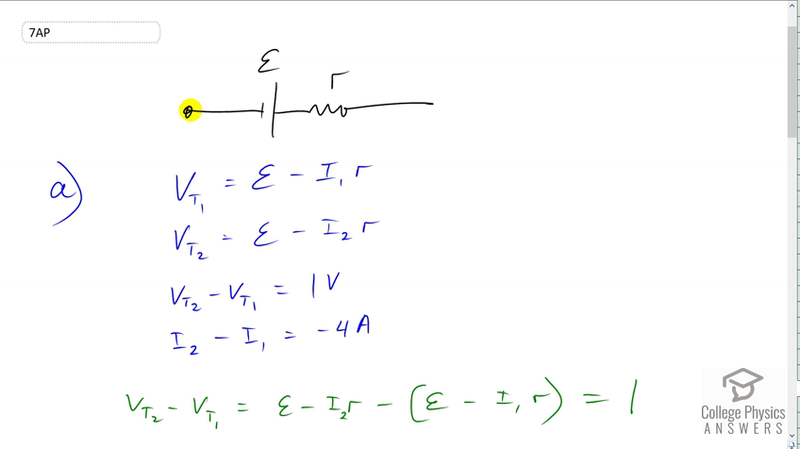 Suppose this source is connected in series (in the same direction) to another source with a different voltage but same internal resistance. What will be the total internal resistance? How will the total internal resistance change if the sources are connected in the opposite direction? This is College Physics Answers with Shaun Dychko. We have an EMF with an internal resistance and we don’t know what each of these values are yet. But we do know that when the terminal voltage between these two points, is it increases by one volt, when the current through this battery decreases by four Amps. And so the terminal voltage increases because when the current decreases, that will decrease the voltage drop across the internal resistance. And so since there’s a smaller voltage drop across here, it increases the total voltage drop between the terminals because the voltage drop across the resistor is going to be the opposite direction to the EMF. And so it’s going to be reducing the terminal voltage. And so by reducing the current through this, we are reducing the voltage drop across internal resistance and thereby reducing whatever is opposing this EMF so to speak and increasing the terminal voltage. So, we write down some formulae for the terminal voltage and then include the information that we’re given. And so we have in the case one, the terminal voltage is the EMF minus the current in the first case multiplied by the internal resistance. And in scenario two, we have the same EMF minus a different current I2 multiplied by the internal resistance. And we’re told that the difference between these two terminal voltages is one volt. So, VT2 is one volt greater than VT1. And so that’s the same. And the current in case two is four less than the current in case one. So, I2 minus I1 should be negative four Amps. So then we can subtract the two negative voltages. And so this is the formula for terminal voltage two. And then subtract from that the formula for the terminal voltage one. And that equals one because of what we said here. And then the EMFs make zero and then we have a negative I2r plus I1r because this negative and this negative makes a plus. Then equals one. And we can factor out the internal resistance r. Then we get r times I1 minus I2 all equals one. And then divide both sides by this bracket. And you get r equals one over I1 over I2. Now we have I1 minus I2 given to us. So let’s change the way this looks down there. And then we’ll multiply it by negative one times negative one which is one, which is why I’m allowed to do what I’m about to do which is to change the sign of both things inside the bracket. And then put the negative sign outside the bracket. So negative of I2 minus I1. And then I2 minus I1 is negative four. So substitute that in. And we have negative of negative four is positive four at the bottom. That is one quarter which is 0.25 ohms. And that’s the internal resistance. Then, in part b, this says suppose this source is connected in series to another source with the different voltage but the same internal resistance. So we have one EMF with an internal resistance and then another EMF which is different but has the same internal resistance so I did not put a subscript in the internal resistances because they are the same. And what will be the total internal resistance is the question. So the terminal voltage from here to here is EMF one minus the voltage drop across this internal resistance plus EMF two minus the voltage drop across that internal resistance. The current of course is the same of the both these resistances because they are in series. So this is EMF one plus EMF two minus I times two R. And so this is of the form, the same form as our terminal voltage formula which is EMF minus I times internal resistance. EMF in this case is EMF one plus EMF two. And then minus I times total internal resistance which in this case is two r. So the total internal resistance is two R which is two times 0.25 ohms which is 0.5 ohms. And if the second EMF is connected in the opposite direction, then the terminal voltage from here to here, we could traverse this branch by starting here and go across this EMF one, lots of positive EMF one. Since we started the negative and go to the positive terminal. And then suppose the current is going this direction. And then we have a drop across this internal resistance here, I times little r. And then minus EMF because we started with positive and then go to this negative terminal of this EMF. And then minus Ir here. And then we have EMF one minus EMF two minus I times two r. The total EMF is now this and the internal resistance is the same. And so there’s no change.